i am happy to have a handful of great old German files. my uncle found them digging around in his basement workshop. i already have the first one shaped and rough ground. will be heat treating it tomorrow. i am thinking about a nice wood handle. i have some beautiful bloodwood that would really fit this slim design. so pleased to be making some new file knife designs. Beautiful knife; I like the shape of that one! Look forward to your "art" with these. thanks, i think i will do a mix of old and new designs with this batch of files. Very nice! My wallet and the wife/book keeper are not in sync to add to my modest collection. I sure do appreciate your work. I have a planer blade knife by Ruana here in MT, a big skinner style with Stag handles. A few stains from game dressing, but a work horse blade for years now. Stay tuned. Pics to come. Saweeeeeet!! I dig some file knives!! Nice to see you found some more files to work with! Love the one you made for me. I have a bunch of knives including a few from Dozer, one of which is my EDC, but when I want to show off a knife I pull out one of the file knives of his that I have. They are by far the coolest knives I own. I appreciate the kind words, fellas. I hope the large file will make a nice Bowie model. I like the lines of that knife so far. Looking forward to an update of the finished product with the wood handle! So for those in the know. I have heard that folks look for the German made files, but why are they sought after? Just a "better" German thing??? I am trying to learn more about different steels. well, i have this one polished and etched. it is ready for the handle now. i think this bloodwood will look very nice on this design. Nice ! How much will it cost me ? If you are interested, just shoot me an email at liontribedesigns@gmail.com. 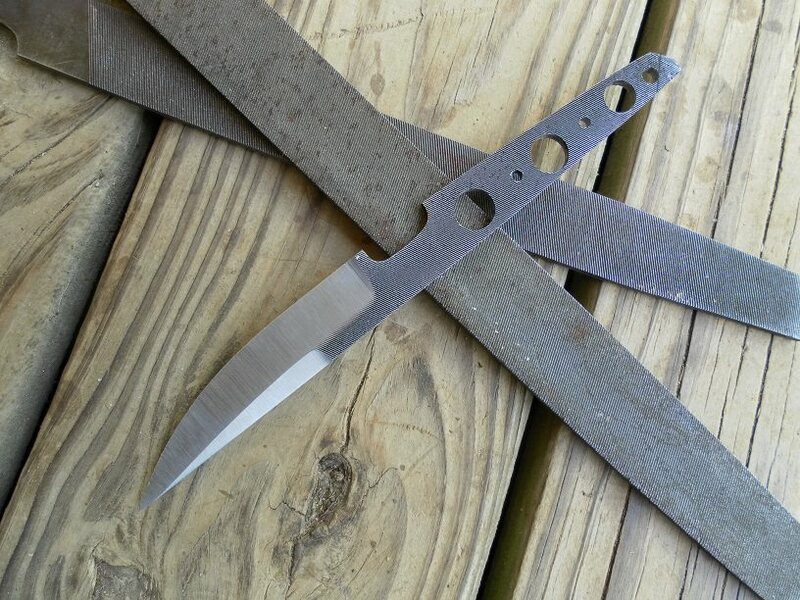 My file knives are generally cheaper than most because you don't have the cost of new steel bar stock. I’m kind of liking the no grip look. Makes for a slim boot knife. It would look neat like that with a double edge. I’d have to throw it if I got one. i may make one with no handle when i get the chance, that sounds like a good idea. here is the finished product as of today. just have to sharpen and sign it.